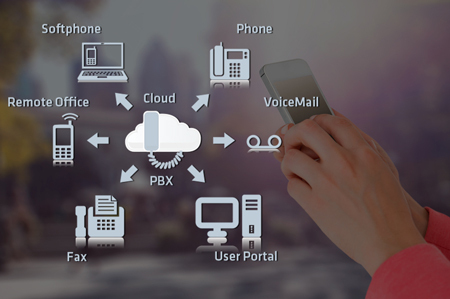 Should Your Business Switch to VoIP/Cloud PBX? Should Your Business Switch to VoIP/ Cloud Office Phone Solution? You're at an internet café and get an important business call--on your laptop. You're on the road and receive an urgent voice mail--in your e-mail inbox. Your business has a phone number with a Singapore area code--even though your office is in Kuala Lumpur. Welcome to the world of voice over internet protocol (VoIP). With VoIP service, your phone calls travel over the internet as data, just as e-mail does. This type of service can dramatically lower your telecommunications costs while increasing your productivity. It also provides useful features and capabilities that conventional phone technology can't offer. Though VoIP is quickly gaining popularity, some small businesses are still on the side-lines, concerned that VoIP audio quality is substandard, that the technology is difficult or costly to implement, or that their phone service will be interrupted if their electricity goes out. The truth is, VoIP's benefits far outweigh any potential drawbacks. Here's what you need to know about VoIP to decide if it's right for your business--plus tips for making the most out of VoIP service. 1. Since its inception, the quality of VoIP service has come a long way. Early VoIP products required both parties in a conversation to be at a computer. Not only was this extremely limiting, but the sound quality was often poor. Today's VoIP service has evolved and allows you to make and receive calls using standard phones or, even better, feature-rich IP phones. Sound quality has vastly improved, too--in fact, many businesses today have abandoned traditional phone systems in favor of VoIP. Many of these businesses have the ability to leverage their own data network to carry phone calls originating and terminating within their office with additional savings and benefits. And with VoIP, businesses no longer have to maintain separate networks for phones and data--another significant money saver. Also, the costs associated with employee moves, adds and changes--which can cost RM100 or more per occurrence--are virtually eliminated. All you have to do is move your IP phone (or traditional phone with a VoIP adapter) to a different broadband network jack and plug it in. Take your phone system with you. As long as you have access to a broadband connection, you can use your VoIP system anywhere, such as in a hotel room or at a friend's home. Customers and employees can stay in touch just by calling your regular business phone number--they don't need to call your cell phone, which means you can save precious cell phone minutes. Talk on your laptop. Many VoIP systems include telephony software that enables you to send and receive calls using a headphone/microphone unit connected to your computer. Now you won't miss an urgent call from a client, even when you're hanging out with your laptop at an internet café. Get voice mail and faxes with your e-mail. Many VoIP services allow you to have voice mail and faxes automatically forwarded to your regular e-mail inbox. You get all your messages in one place, and your voice mail and faxes can be easily archived or forwarded to others. Users can also get their e-mails "read" to voice mail. Get virtual phone numbers. Your phone number can have any available area code, not just the one assigned to your region. For example, a business based in Kuala Lumpur could have a phone number with a China area code--particularly advantageous if your business has (or wants) customers in China. Increase productivity. Many VoIP phone numbers can be configured to simultaneously ring on multiple devices--such as your cell and landline phones--before going to voice mail, thus eliminating time-consuming "phone tag." In a recent survey conducted by Sage Research, the increased productivity enabled by internet telephony added up to 3.9 hours per week, per employee. When in doubt, hire an expert. An off-the-shelf VoIP system for a business with a few employees is fairly straightforward to implement. But larger VoIP systems may work best if installed and configured by experts. Ask your network equipment vendor about VoIP services tailored for small businesses. Use call forwarding. If the power goes out, your computer network may go down--taking your VoIP service with it (unless you have a generator or other alternative power source). For backup, configure your VoIP service to automatically forward unanswered calls to a cell or landline number. Secure your network. VoIP's growing popularity is attracting the attention of hackers, and users are concerned that hackers may digitally intercept VoIP calls or bring down a company's VoIP system using denial-of-service attacks. The solution? Make sure your network security is thorough and up to date. For more information, see my earlier article, "Is Your Business Safe from Internet Security Threats?." One thing's for sure: VoIP technology is continually evolving, with compelling new benefits being developed for small businesses. For example, some new wireless android/IOS combination devices allow you to use your VoIP service whenever you're near a Wi-Fi network and use your cell phone service when you're not. Among the advantages: a dramatic increase in mobility and a sharp decrease in your cell phone charges. For larger small businesses, having a single IP network for both voice and data can provide other advantages, too. For example, an IP network can also support real-time, high-quality, affordable videoconferencing, call center applications and more.